My kids like tuna salad so I thought it was time to step things up and make salmon salad. 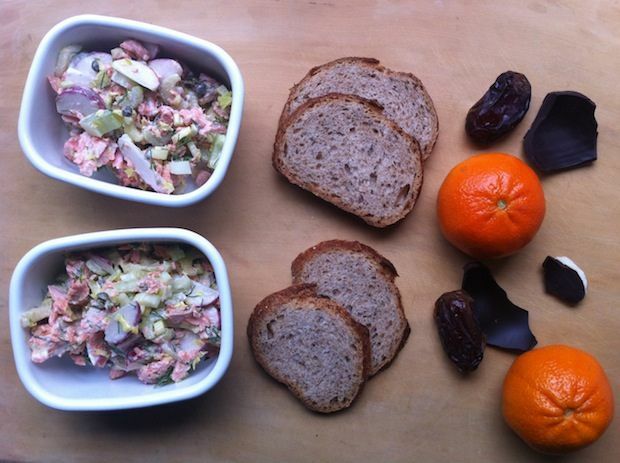 I poached the salmon in salted water (but could have just as easily roasted it -- it's up to you) and mixed it with nearly equal parts sliced celery and wedged radishes (salmon is expensive! ), capers, dill, mayonnaise, and Dijon mustard. To go with everything, I packed a few slices of rye. My kids love medjool dates, so they went in, too, with some clementines to cut the sweetness of the dates, and some leftover chocolate Easter bunny for fun. What's your go-to desk lunch? Love all of these lunch ideas! Our son is a massive fan of smoked salmon, but I have never thought to include in his school lunch for some reason! Thanks for the inspiration. This looks fantastic! I think I am going to try this for lunch all the way around in our home. My hubby just recently started eating salmon and our 5 year old pretty much eats (or at least tries) everything we suggest she try. Your kid's lunches are sure inspirational and delicious looking. You are a blessing!! Thank you -- glad you find them helpful! Hi Amanda, did you just use salt and water to poach the salmon? Also, how do you feel about canned salmon? It's been years since I had it but I know there are some sustainable brands that focus on wild caught salmon - I'm just not sure about the taste. Yes, I used just well-salted water for poaching. Re canned salmon, if you find a brand you like, I think that would work just fine! I hope your kids appreciate the thought you put into making them such delicious and varied lunches, Amanda. They always look so appetizing.